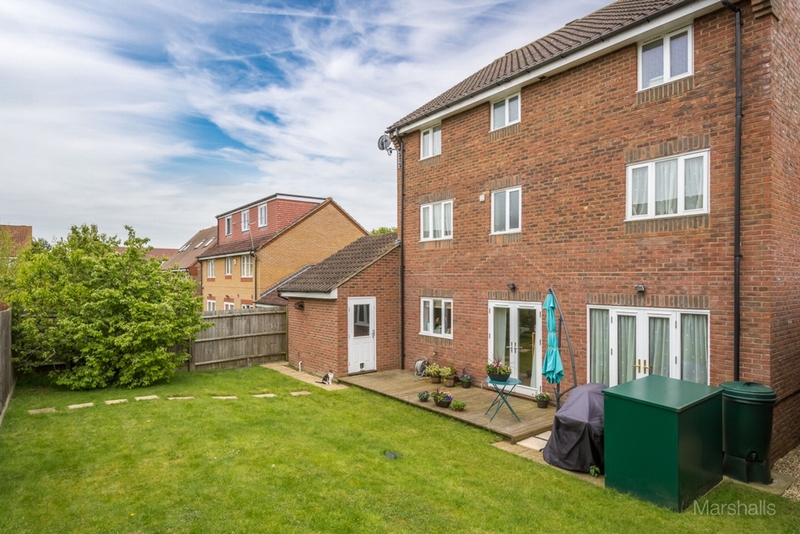 Marshalls Estate Agents are pleased to offer to the market this seven bedroom family home, on the west side of Milton Keynes. 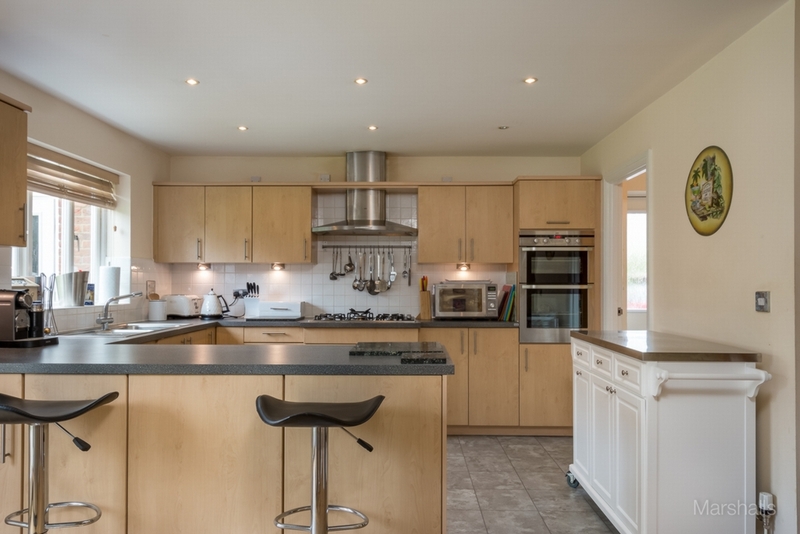 Situated at the end of a private road and offering spacious accommodation including: lounge, dining room, study, kitchen/breakfast room, cloakroom, utility room, seven double bedrooms, two en-suites, a Jack and Jill en-suite and family bathroom. ENTRY: Via composite front door. ENTRANCE HALL: Ceiling light, coving to ceiling, stairs rising to first floor, wall mounted thermostat, radiator, 'Amtico' flooring, doors to: cloakroom, lounge, study and kitchen/breakfast room. CLOAKROOM: Ceiling light, radiator, part tiled walls, extractor fan, fitted with a two piece suite comprising of a low level WC and pedestal hand wash basin. 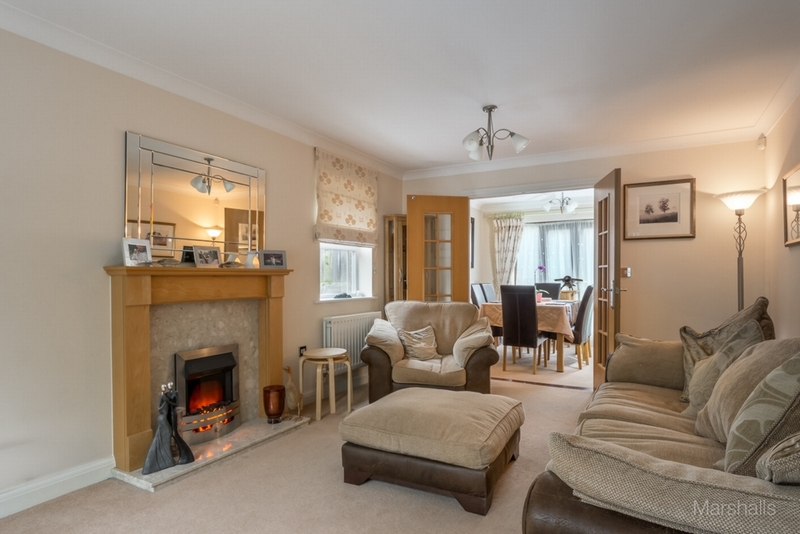 LOUNGE 5.3m (17'6) x 3.5m (11'4): Two ceiling lights, coving to ceiling, two radiators, electric fire set in feature fireplace, television point, telephone point, double glazed windows to front and side aspects, double doors to dining room. DINING ROOM 3.5m (11'4) x 2.9m (9'5): Ceiling light, coving to ceiling, radiator, double glazed double doors to garden, door to kitchen/breakfast room. STUDY 2.7m (8'10) x 2.6m (8'8): Ceiling light, coving to ceiling, telephone point, television point, radiator, double glazed window to front aspect. KITCHEN/BREAKFAST ROOM 5.1m (16'9) max x 4.2m (13'9) max: Ceiling light, inset spot lights, 'Amtico' flooring, under stairs storage cupboard, two radiators, fitted with a range of wall and base mounted units with squared edge work surfaces over, integral fridge and freezer, integral dishwasher, integral double oven, five ring gas hob with extractor over, one and a half bowl sink unit with mixer tap, door to utility room, double glazed doors to garden, double glazed window to rear aspect. UTILITY ROOM: Ceiling light, wall and base mounted units with work surfaces over, stainless steel sink unit, space and plumbing for washing machine, radiator, tiled splash back, door to side. 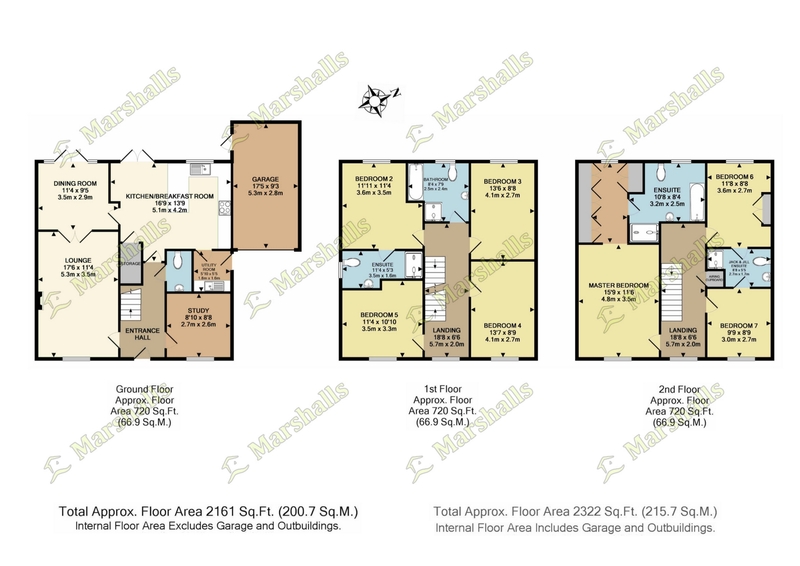 FIRST FLOOR LANDING: Two ceiling lights, coving to ceiling, radiator, double glazed window to front aspect, stairs rising to second floor, doors to family bathroom and bedrooms: two, three, four and five. BEDROOM TWO 3.6m (11'11) x 3.5m (11'4): Ceiling light, coving to ceiling, radiator, double glazed window to rear aspect, door to en-suite. EN-SUITE: Ceiling light, radiator, double glazed window to side aspect, fitted with a three piece suite comprising: low level WC, pedestal hand wash basin and a shower cubicle with power shower. 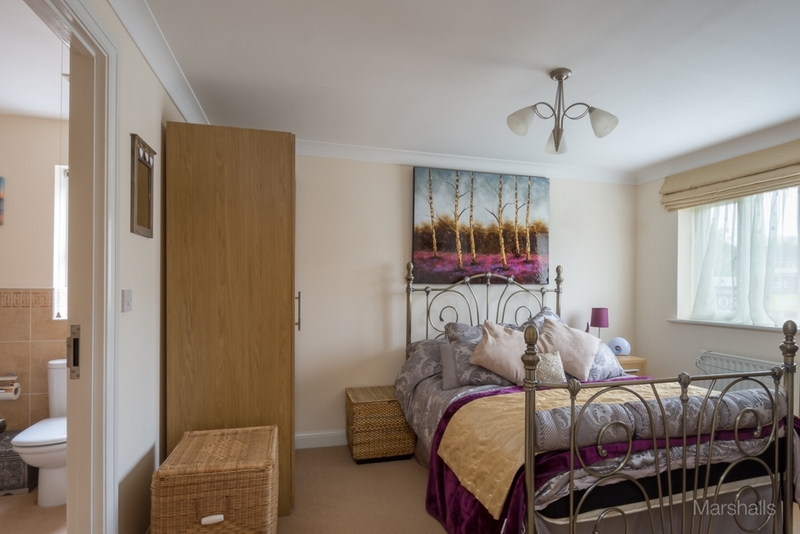 BEDROOM THREE 4.1m (13'6) x 2.7m (8'8): Ceiling light, coving to ceiling, radiator, double glazed window to rear aspect. BEDROOM FOUR 4.1m (13'7) x 2.7m (8'9): Ceiling light, coving to ceiling, radiator, television point, telephone point, double glazed window to front aspect. BEDROOM FIVE 3.5m (11'4) x 3.3m (10'10): Ceiling light, coving to ceiling, radiator, telephone point, television point, double glazed window to front aspect. 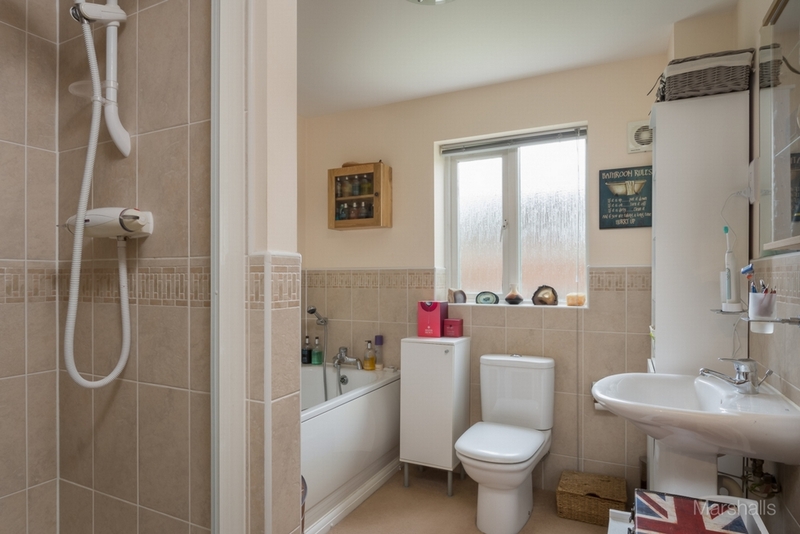 FAMILY BATHROOM: Ceiling light, part tiled walls, radiator, double glazed window to rear aspect, fitted with a four piece suite comprising: low level WC, pedestal hand wash basin and a panelled bath with mixer tap and shower attachment, separate shower cubicle with Aqualisa power shower. 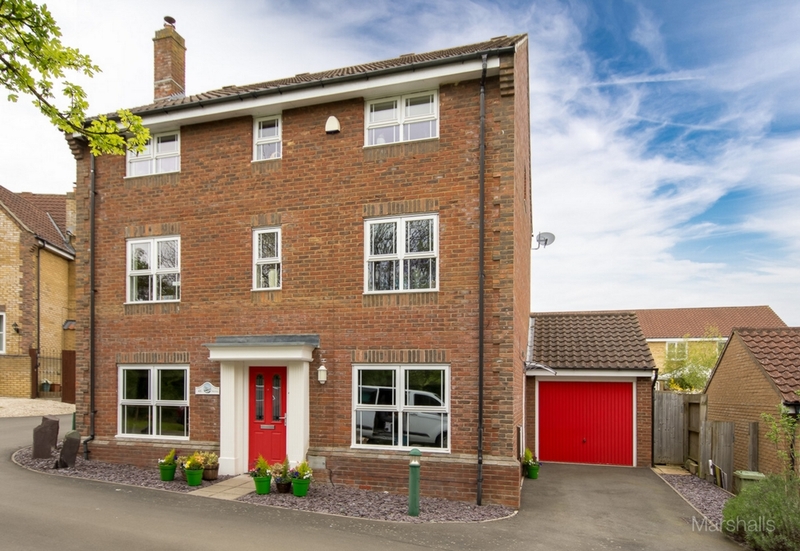 SECOND FLOOR LANDING: Two ceiling lights, coving to ceiling, loft access to a part boarded loft with light, radiator, airing cupboard housing mega flow system, double glazed window to front aspect, doors to bedrooms: one, six and seven. BEDROOM ONE 4.8m (15'9) x 3.5m (11'6): Ceiling light, coving to ceiling, radiator, telephone point, television point, double glazed window to front aspect, through to dressing area. 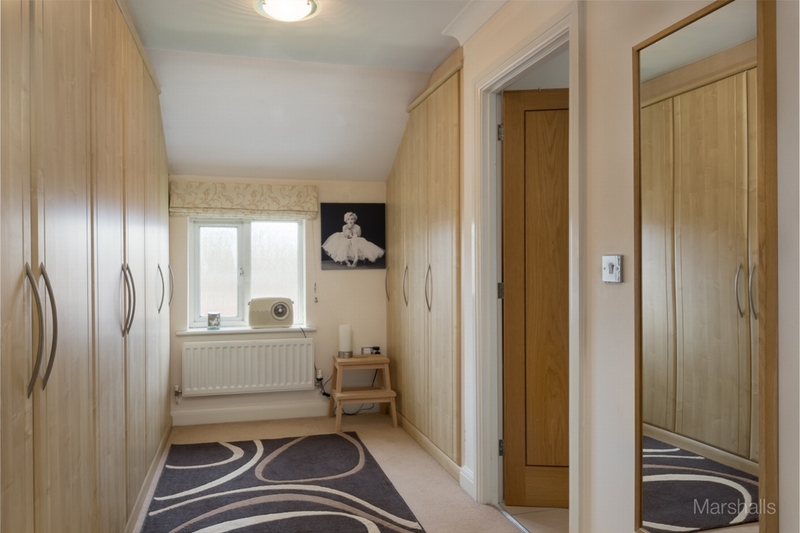 DRESSING AREA: Ceiling light, coving to ceiling, fitted with a range of wardrobes with hanging rails and shelving, radiator, double glazed window to rear aspect, door to en-suite. 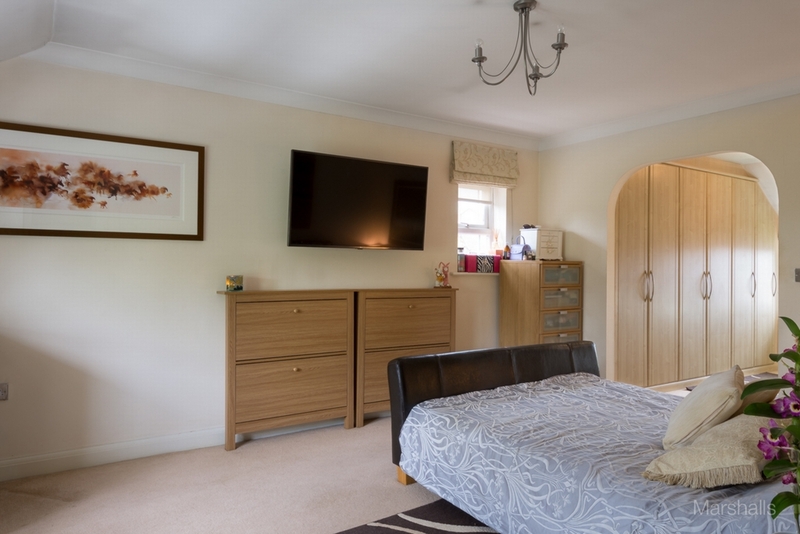 EN-SUITE: Ceiling light, radiator, tiled floor, part tiled walls, double glazed window to rear aspect, fitted with a four piece suite comprising: low level WC, pedestal hand wash basin, panelled bath with mixer tap and a double shower cubicle with power shower. BEDROOM SIX 3.6m (11'8) x 2.7m (8'8): Ceiling light, coving to ceiling, radiator, double glazed window to rear aspect, door to Jack and Jill en-suite. BEDROOM SEVEN 3m (9'9) x 2.7m (8'9): Ceiling light, coving toc ceiling, radiator, double glazed window to front aspect, door to Jack and Jill en-suite. 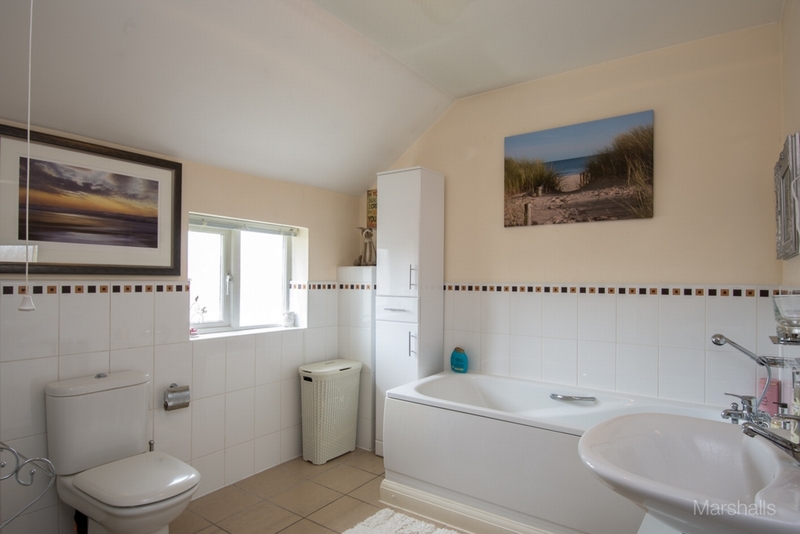 JACK AND JILL EN-SUITE: Ceiling light, double glazed window to side aspect, part tiled walls, radiator, fitted with a three piece suite comprising: low level WC, pedestal hand wash basin and a shower cubicle with power shower. 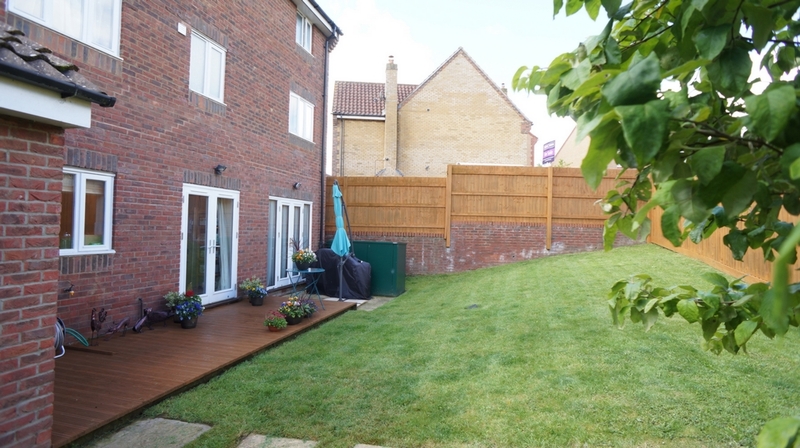 REAR GARDEN: Decking, patio, lawn, path to gated side access, outside lights, outside tap, door to garage, fence and wall surround. GARAGE: Single with up and over door, power and light, wall mounted boiler, eaves storage. 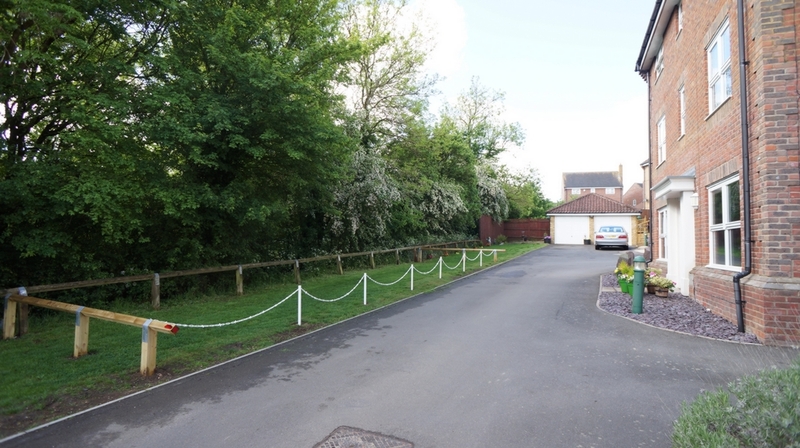 PARKING: Driveway leading to garage.